Newly constructed transitional shelter belonging to Sunil and Niroshini. In May 2017, heavy rains resulted in floods and landslides affecting over 630,000 people in Sri Lanka, with 203 people losing their lives. The adverse weather conditions destroyed over 3,000 houses and partially damaged over 70,000 houses. Although 15 districts were affected by the floods, the Kalutara, Galle, Matara and Ratnapura Districts in the South Western quadrant of the island were severely affected due to both floods and landslides. Approx. 267,960 people were affected by floods and landslides in Kalutara and Galle districts which amounted to 42 percent of the total affected. In these two districts, 1,047 houses were fully damaged and 33,278 houses were partially damaged. 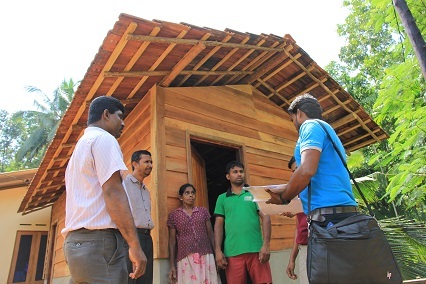 In response to this crisis, UN-Habitat provided relief assistance to affected communities in Kalutara and Galle districts through the project “Emergency Shelter Relief for Flood and Landslide Affected Households in Kalutara and Galle Districts of Sri Lanka”. The project was funded by the United Nations Central Emergency Response Fund (CERF) and implemented by UN-Habitat from July – December 2017. As a priority intervention, UN-Habitat addressed emergency shelter needs of families whose houses were fully or partially destroyed by floods and landslides. Assistance was provided through grants for shelter repairs and construction of transitional shelters in safe locations for landslide affected households or in their own properties for returnee flood affected households. The project also provided 10 percent of the NFI needs of the total affected population in the two districts. 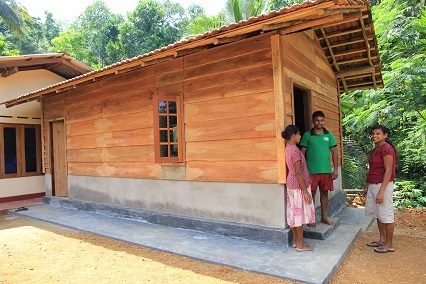 Mr. Sunil Jayawansha’s family from Athwelthota village in Kalutara District was provided with a transitional shelter through this project, as his home had been damaged due to landslides. Athwelthota village, consisting of 402 families is located in the Kalutara District. This beautiful village in the interior of Kalutara is composed of hilly terrain with steep slopes prone to landslides. The main livelihoods of the residents include tea plucking, cinnamon cultivation, and daily wage labour. The disaster had affected over 105 families, nearly 450 people, in this village. Thirty four year old Sunil Jayawansha is a daily wage worker while his wife Niroshini Kumari earns a small monthly income as a tea plucker. After the couple got married in November 2008, they constructed a small house in the Porathota Mukalana area in a plot of land given by a family member. They lived happily with their five year old daughter in this house until they were forced to evacuate due to landslide damage in May 2017. In May 2017, heavy rains and the resultant landslides due to slope instability had damaged their house extensively. As a result, the family evacuated from their home and sheltered in a nearby school. Discussing the disaster situation faced by the family, Sunil mentioned that it was one of the most traumatic experiences of his life. “Our home, earnings and belongings were destroyed within minutes. We could do nothing to stop it. We were forced to evacuate to a safe location as our lives were in danger”. UN-Habitat technical team discussing the transitional shelter construction progress with Sunil Jayawansha’s family. When UN-Habitat commenced the CERF project activities in the area, Sunil Jayawansha’s family was selected for transitional shelter assistance as they had no financial resources to rebuild an alternate house. As the area where their damaged house was located was deemed unsafe for occupation, they had to find alternate land to build the shelter. Luckily for the family, one of Sunil’s relatives had offered space to build their shelter adjoining their own permanent house in their front garden. Sunil Jayawansha’s daughter is happy in her new home. feet high masonry wall has been constructed to protect the timber cladding which covers the walls. Joinery and roof tiles from their damaged house have been reused in the shelter to save costs. Timber poles from trees that are readily available in the area have been used as roof rafters. A concrete apron has been constructed to prevent erosion around foundation during rains. Having completed the main structure, Sunil is constructing a small kitchen adjoining the shelter to prepare their meals. “We are so happy that we were able to build this new shelter with the support of UN-Habitat. We reused some building materials that were salvaged from our old house, and this helped us to construct the house more cost-effectively. We feel happy as we can live safely in this shelter.” Sunil Jayawansha stated. This emergency relief assistance project was implemented by UN-Habitat in partnership with the Ministry of Disaster Management, Disaster Management Centre, National Building Research Organisation, District and Divisional Secretariats, Community Based Organizations, local banks and community members. Overall, the project has provided 86 shelters to families while assisting in the repair of 692 damaged houses and provided 6,358 NFI kits consisting of vital household items.